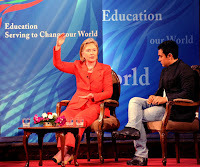 TIMES NOW achieves yet another one-of-a-kind feat by bringing together US Secretary of State Hillary Clinton and TEACH India ambassador and film star Aamir Khan in a unique confluence moderated by our very own Editor-in-Chief Arnab Goswami. Aired through Sunday, TIMES NOW brings together the two dynamic supporters of Educational Campaigns worldwide to discuss the initiatives and their vision for education in India. 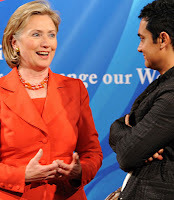 Arnab will chair the discussion as Hillary Clinton and Aamir Khan share their experiences on educational campaigns and their suggestions on how education could shape the future of the two of the largest democracies in the world. Hillary Clinton has been a long time defender of basic education rights and has been supporting campaigns to bolster secular education around the world. Aamir Khan on the other hand has been an active ambassador and volunteer for TEACH INDIA initiative. They will also interact with volunteers of Teach India & Teach for India and share their experiences with them.